Little Italy is undeniably one of the coolest neighborhoods in San Diego. With the ocean to the West and downtown San Diego to the South, you’re surrounded by picturesque views that do an amazing job of complementing the many incredible bars and restaurants that call Little Italy home, including Puerto La Boca. 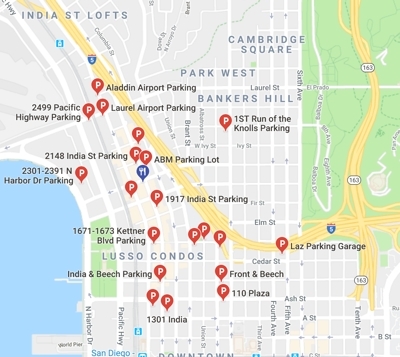 The only downside to Little Italy is that parking can be tough sometimes, so that’s why Puerto La Boca, home to the best Argentinian food in San Diego, has created a guide to the best parking options near our restaurant. The Little Italy Valet is a great option if you don’t feel like looking for a good spot and just want to get to your meal. As of September 1, 2018, the valet is $10.00 a vehicle. There will be a valet available every day of the week between 5:30 PM and 11:00 PM, with additional options depending on the day. For more information, check out the full Little Italy Valet schedule. The County of San Diego parking structure features parking for county workers by day and Little Italy patrons by night, providing affordable parking for only $10 a vehicle from 5:00 PM to midnight during the week and from 6:00 am to midnight on the weekends. Located on the corner of Cedar Street and Kettner Boulevard, this is a reliable option to find parking no matter how busy the streets are. This parking lot allows you to park Monday through Friday from 5:00 PM to 1:00 AM and all day on the weekends for the low cost of $5 a vehicle. This lot is a local hidden gem! Located at W Date Street and Colombia Street, this apartment complex offers pay per space public parking in their underground lot. There is street parking everywhere for those lucky enough to find a spot, featuring a meter that takes credit cards. There are a variety of other parking lots throughout Little Italy that can provide parking for a small fee. The two closest to Puerto La Boca are ABM Parking Lot, on 2131 India Street, and Ace Parking, on 834 West Grape Street. If you are curious what other parking is available near Puerto La Boca, either consult the map below or check out SpotHero, a great website and app to find available parking. If you are planning on coming to Puerto La Boca for lunch or dinner and are unsure where to park, give us a call. Not only are we experts in Argentinian cuisine, but we are also Little Italy parking experts! Call today at (619) 234-4900.